Auto Repair is a fully responsive template best suitable for mechanic auto shop, car repair, auto mechanic, car service, auto repair shop, mechanic workshop, auto service, automotive companies. 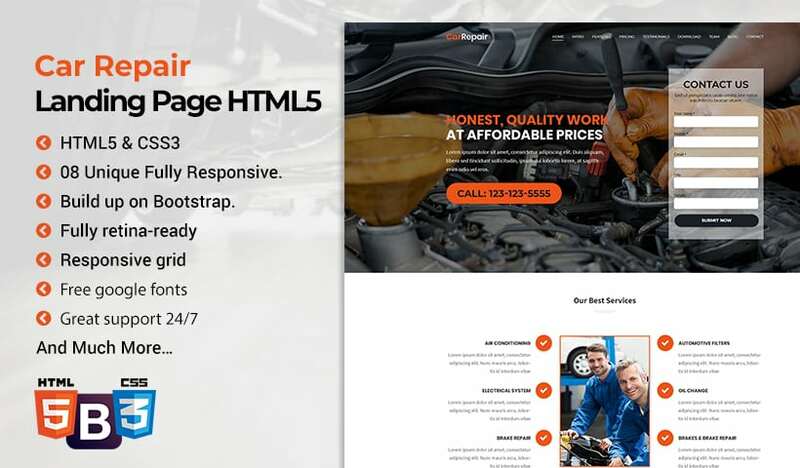 Car repair, motor expert, auto mechanic, car services is professional HTML-5 Landing Page Template with fully responsive layout. It includes well documented files, well organized and named accordingly so it’s very easy to customize and update. This template is specially crafted for auto care, auto center, auto glass, auto inspection, Auto Mechanic, auto painting, body shop, car rental, car repair shop, car service mot, car wash, garage, maintenance, mechanic workshop web pages. Car Repair Landing Page Template designed for creating websites of auto mechanic, automotive repair shops, car service with spare parts and accessories for car repairs, car washes, service stations and car services. This template is appropriate for any type of small businesses related to automobiles – garages motels and gas stations, repair of tires and wheels, repairs of brakes and other parts of cars, car wash, car rental, etc. It has a multipurpose design oriented for automotive topics. 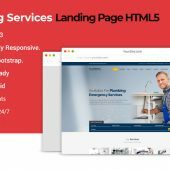 This auto repair Landing Page template includes contact us form, gallery section, specialist area, pricing section, etc. The page contains area of ​​the company, description of work and team members. Template is suitable for users with zero programming skills as well as for experienced developers. Home Loan Landing Page Template includes valid code and optimized structure is one of the key points for a successful website that will be successfully crawled and indexed by search engines. We provide fully support for our valued customers as fast, helping and professional. We care about this status and do our best to make website maintenance easier for you, providing effective troubleshooting. Loan Plus have hundreds of Google fonts let you customize website appearance completely, they are easy to add and can be used anywhere. Loans, Banking, Loan Business, Broker and Finance Landing Page Template has a responsive layout that will respond to your screen width and make content appearance be perfect on all devices, from large desktop screens to mobile phones and tablets. This Template is based on 1170 Bootstrap based design so this Template will be 100% Fluid responsive on any device. We have tested this in iMac, Macbook Pro, iPhone 7 Plus, iPad mini 2 and other devices. Home Loan Landing Page Template has an optimized code and structure, as well as fantastic Custom SEO options for every page and posts, allowing you to easily add important SEO META data to all your website content.